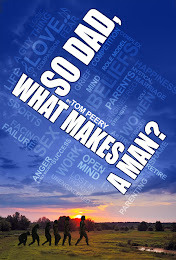 So Dad, What Makes a Man? On a visit to Turkey last year, Mance and I were with a tour group who listened in Ankara to a professor's lecture on the Middle East. At one point, an American in our group asked, "What is it with this region? It never seems to settle down?" The professor paused a moment, then responded, "In history, four people who have talked directly to God are Moses, Abraham, Jesus and Mohammad. They are all from this region. Next question?" Talking this past week with a trainer at our gym, a Lebanese Christian who immigrated here, he regaled me with current Middle East tensions, describing how the Shiites and Sunnis are battling one another in Syria, the Iranian Shiites are sided with the Lebanese Alawites, and Christians are caught in between. He then quoted an Egyptian proverb he thought in a nutshell describes the Middle East: My brother and I against my cousin; my cousin and I against the stranger. He gave an example from a visit he once made to Israel, where a Jewish man confided in him that he thanked God every night for the Palestinians. When he asked why, the man said, "because if the Palestinians were not here, we Israelis would turn on each other." I see how difficult The Golden Rule--based on words of Jesus in the Sermon on the Mount and mirrored in nearly every religion--also seems in the United States right now, where we Americans are turning on each other. It is a seriously difficult challenge for me to live each day treating all Americans the way I would like to be treated, using more unconditional acceptance. Yet Pope Francis has some encouragement: He said, "Goodness always tends to spread. Every authentic experience of truth and goodness seeks by its very nature to grow within us, and any person who has experienced a profound liberation becomes more sensitive to the needs of others. If we wish to lead a dignified and fulfilling life, we have to reach out to others and seek their good. (from his recent Evangelii Gaudium).